Former Sgt. 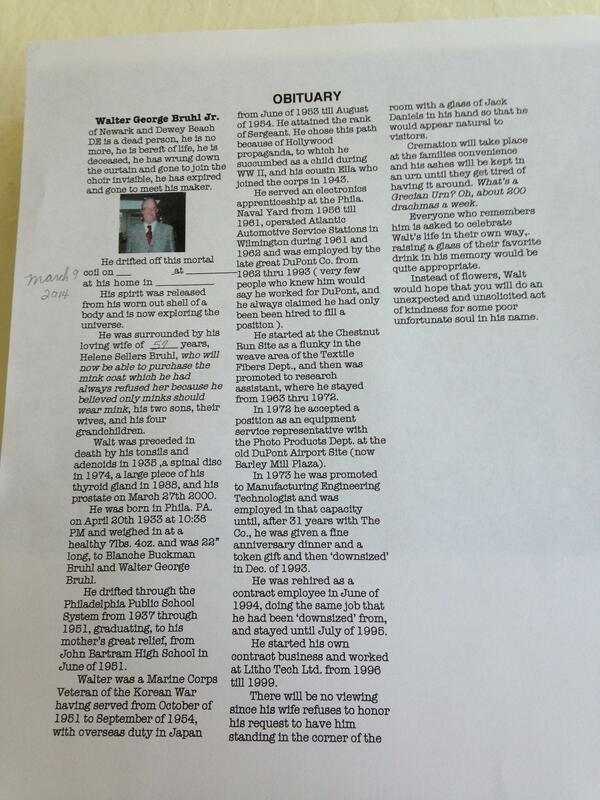 Walter George Bruhl Jr. didn’t leave this Earth without a plan — the Korean War veteran wrote his own obituary, complete with fill-in-the-blank spaces for the date and time of his death. “His spirit was released from his worn out shell of a body and is now exploring the universe,” his obituary states. He died in his home on Sunday. He was 80. His wife, the obituary states, will now be able to purchase the mink coat he always refused to buy her because “he believed only minks should wear minks.” He also listed several parts of his body that preceded him in death including his tonsils, adenoids, a spinal disc and his prostate. That would’ve made him appear natural to visitors, the obituary states. Bruhl’s grandchild, Sam, posted a copy of the obituary to Reddit. You can also hear an interview with Bruhl’s son, Martin, who discussed his dad’s sense of humor with NPR below. Semper Fi mate, I want to be at the luncheon also when my time comes, but I doubt seriously if my family will comply with my wishes. See you guarding the streets of heaven, when my time comes. Maybe we will hit the beach together, when God calls on us to put Satan and his minions to rest forever. Semper Fidelis. Semper Fi, brother. When my turn comes, I hope to have an attitude like yours. Take care old friend….it won’t be long now until I too will see the Halls of Heaven….with our Men standing sweet vigil over those Gates and Halls!